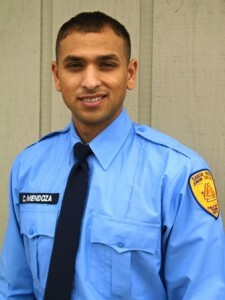 Cesar Mendoza of Ukiah started classes today at Santa Rosa Junior College police academy. At the Foundation’s December 17 meeting, the Board received Cesar’s request with a personal interview and a strong endorsement from Chief Dewey. Financial support was unanimously approved, in expectation that he will graduate from the one-year program and join the Ukiah Police Department. Cesar is a well-known local athlete who is fluent in English and Spanish. He works during the day at Home Depot and goes to police academy in the evenings. 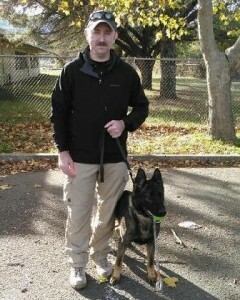 Ukiah’s population is approximately 40 percent Spanish speaking, and the police department has about 20 percent bilingual staff, so Cesar will be a welcome asset when he completes his training. This entry was posted in News & Announcements on January 21, 2016 by Blog Editor. At its regular meeting, the Mendocino Public Safety Foundation considered a grant request from the Fort Bragg Police Department to restart its K9 program, which had expired with the retirement of the only officer who had handled their canine (K9) and run the program. After a presentation by Chief Fabian Lizarraga and Lieutenant Charles Gilchrist, the Foundation board unanimously approved a grant of $11,500 to start up the K9 program. A source and dog and have identified, with training for its handler included in the cost. It has been proven that the presence of a police dog, serving as a K9 officer, can help protect other officers and the public, prevent a situation from escalating into violence, and depending on their training may detect dangerous or illicit substances such as bombs or narcotics. This entry was posted in News & Announcements on January 4, 2016 by Blog Editor. 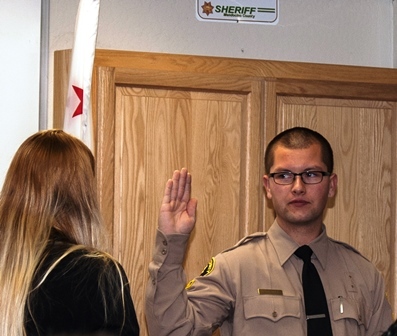 Ukiah, CA – December 5, 2015: Damien Angel took the oath at the Sheriff’s training center in a group swearing-in ceremony, after graduating from the extended Police Academy program. The Foundation paid for the final two months of his year-long program, enabling him to complete the training. Sheriff Tom Allman stood by as badges were pinned to the newly sworn officers. This entry was posted in News & Announcements on December 29, 2015 by Blog Editor. Ryan Kelly of Ukiah graduated from Police Academy in September, at the Santa Rosa campus. Sheriff Tom Allman and Foundation board member Roger Foote attended the ceremony. 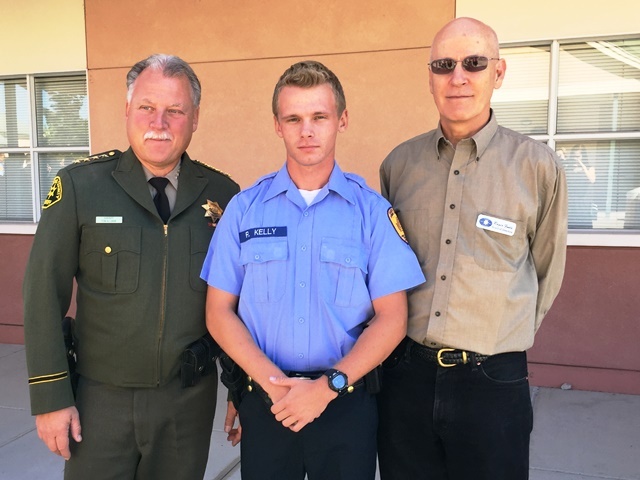 Ryan started the training course in May, with a loan of $6,800 from the Mendocino Public Safety Foundation for tuition and expenses. He looks forward to work as a sheriff’s deputy here. Under the scholarship program guidelines, the loan is to be forgiven after three years of service. Ryan Kelly is the fifth scholarship loan recipient under the Foundation’s program. Our near-term goal is to fund at least six more scholarships for local residents to attend policy academy and go to work as officers in Mendocino County. The program will fund up to $11,000 each to qualified candidates. For more information, see our brochure in the sidebar of this webpage. This entry was posted in News & Announcements on October 11, 2015 by Blog Editor. Thanks to all who “like” us so far! This entry was posted in News & Announcements on May 17, 2015 by Blog Editor. 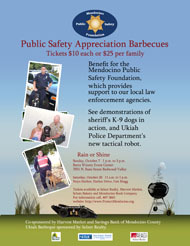 Ukiah, CA – March 2015: Last month’s annual barbecue with Sheriff Allman, deputies and canines was well attended, with twice the expected turnout. Held at Barra Event Center in Redwood Valley on February 8, about 70 Foundation members and friends gathered in a convivial setting. Sheriff’s deputies gave a dog demonstration, with a Malinois and Red the bloodhound showing off their K-9 officer skills and training. The dogs are essential members of the law enforcement team. Ross Liberty, President of Mendocino Public Safety Foundation, gave a presentation and talked about the nonprofit foundation’s programs. Currently, we are recruiting local candidates for scholarship loans to enroll in academy training that leads to employment in police and deputy positions in Mendocino County. Scholarship alumni Cody Mason and Alex Johnston were on hand to share their experiences. Afterward, the Foundation’s Board of Directors held the annual meeting. A new candidate was interviewed for a scholarship loan. Many members renewed their memberships, bringing in fresh funds to the Foundation. The 2015 goal is to fund at least six more scholarships for local residents to attend policy academy and go to work as officers in Mendocino County. A good time was had by all. KZYX public radio covered the event for the community news. Thanks to everyone who attended, contributed and supported us! We will keep you informed. And next time you see a local law enforcement officer, remember to say “thanks” for all they do. This entry was posted in News & Announcements, Public Events on March 8, 2015 by Blog Editor. Ukiah, CA – January 2015: The Mendocino Public Safety Foundation released its Annual Report in time for the annual membership meeting, Sunday, February 8, from 1 – 3 p.m. at Barra Event Center, 7051 N. State Street, Redwood Valley. Please join us and Sheriff Tom Allman for lunch and meet the sheriff’s K-9 and bloodhound crew. We will discuss our program of recruiting and financially supporting local candidates for police and deputy positions. Tickets are available at the door. A donation of $15 per person or $35 per family is requested. This entry was posted in News & Announcements, Public Events on February 2, 2015 by Blog Editor. 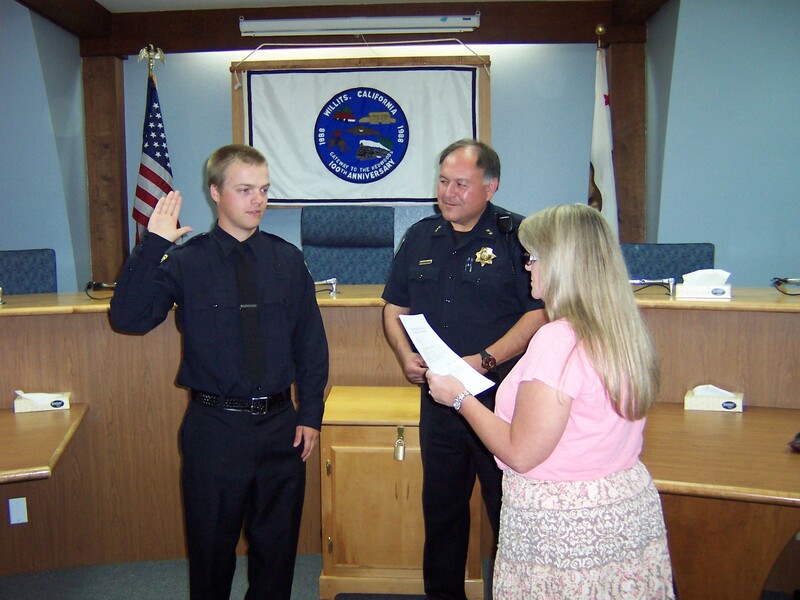 Willits, CA – July 7, 2014: Cody Mason was sworn in today as a Willits police officer by Deputy City Clerk Cathy Sanders with Police Chief Gerry Gonzalez looking on. This entry was posted in News & Announcements on December 18, 2014 by Blog Editor. 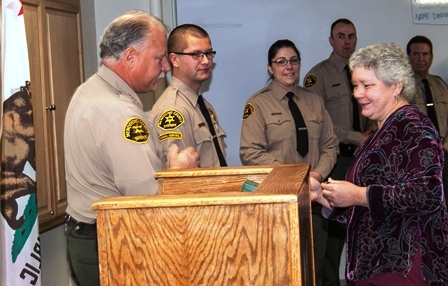 Ukiah, CA – Nov. 14, 2013: The Mendocino Public Safety Foundation has made the first loans in its new program to help local candidates attend police academy. The $7,000 “scholarship/loans” cover tuition, uniform, equipment and expenses and will be forgiven in full if the candidate works for at least three years as a police officer or sheriff’s deputy in Mendocino County. Cody Mason and Diego Sanchez, both of Willits, are the first two recipients of the scholarship/loans and will begin police academy at Santa Rosa Junior College in January. Both are prospective sheriff’s deputies. The scholarship/loans were conceived by Ukiah police chief Chris Dewey as a way to help hire and keep local peace officers. Retention of officers and deputies has been a major problem because of higher salaries offered in other parts of California. “This funding is very important to law enforcement,” says Dewey. “It helps us keep police officers and deputies local. This funding allows our local candidates with strong ties to our community the opportunity to attend a police academy.” The Mendocino Public Safety Foundation is a 501(c)(3) charity established in 2011 to channel local donations to assist the police chiefs and sheriff. It has purchased police dogs and a tactical robot for local law enforcement, using donations from over 200 local residents and businesses. The Foundation is funded by local donations and will be launching a fund-raising drive to support the scholarship/loans. “Donations are essential to helping us keep local candidates here in the County,” said Dewey. The Foundation is chaired by Jim Eddie of Potter Valley, a former long-time county supervisor. Foundation president is local businessman Ross Liberty. Tax-deductible donations can be sent to Mendocino Public Safety Foundation, P.O. Box 123, Ukiah. This entry was posted in News & Announcements on November 14, 2013 by Blog Editor. 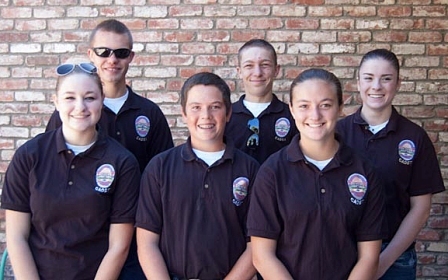 Ukiah, CA – July 25, 2013: A new scholarship program is now launched by the Mendocino Public Safety Foundation to recruit local candidates for peace officer training, followed by employment and retention in the Mendocino County Sheriff’s and three City Police departments work force. The program will fund peace officer or correctional officer academy costs for nominees of the sheriff or police chiefs, as a loan that will be forgiven upon three years’ local service as a sheriff’s deputy, corrections deputy or police officer, including service as a reserve officer. “Here in Mendocino County one of our most significant challenges is recruiting and retaining high quality law enforcement officers. We are constantly competing with surrounding law enforcement agencies that offer more competitive salaries and benefits. Being able to recruit locally, and develop our own applicants is key to the future success of law enforcement here in Mendocino County,” said Chief Chris Dewey. The Foundation, in cooperation with the Police Chiefs and Sheriff as ex officio members, will invite applications. Materials will be available at www.protectmendocino.org. Approved nominees would receive a conditional offer of employment or reserve office appointment upon satisfactory completion of Santa Rosa Junior College police academy or correctional officers’ academy. Loan agreements would be between the scholarship award winners and the Foundation. The loans will cover academy tuition, uniform and equipment, as well as approved miscellaneous expenses, a value of approximately $6,000. Interest will be at one percent, with no repayment unless the candidate defaults under the agreement. The entire loan and interest will be forgiven upon completion of three years of service. The Foundation also may waive repayment under other circumstances. 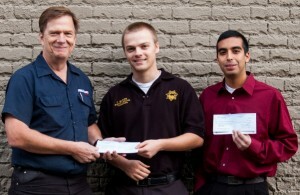 The Foundation plans to fund 2013 scholarships with its existing fund balance. The Foundation, a 501(c)(3) charity, was organized in 2011 to raise private funds to assist local law enforcement. The Foundation is continuing to accept donations from the public, including local businesses. Donations are tax deductible, depending on the donor’s individual tax status. 100 percent of every dollar given by general donors will be passed on in support of local law enforcement. All Foundation personnel are volunteers, and fund-raising costs are funded by separate donations received for that purpose. The Foundation is governed by a Board of Directors headed by Jim Eddie of Potter Valley, a former County Supervisor. Donations to the Mendocino Public Safety Foundation can be mailed to P.O. Box 123, Ukiah, CA 95482, or made through PayPal at www.ProtectMendocino.org. The Foundation can be contacted by email: info@ProtectMendocino.org. This entry was posted in News & Announcements on July 25, 2013 by Blog Editor. Donations to the Mendocino Public Safety Foundation can be mailed to P.O. Box 123, Ukiah CA 95482, or made through PayPal on the Foundation’s website, www.ProtectMendocino.org. The Foundation can be contacted by email at info@ProtectMendocino.org. See what local officers have to say about serving in Mendocino County. We want more local people trained in law enforcement to then be able to serve here at home in our community.